Funeral services for Phyllis J. Polman (right), who died January 27 in Warsaw, Ind., have been announced. Friends may visit on Wednesday, January 30, 2008 from 2–5 p.m. at Redpath-Fruth Funeral Home, 225 Argonne Road, Warsaw, Ind. Services will follow at 5 p.m. with Pastor Bruce Barlow officiating. A memorial service will be held at 2 p.m., Thursday, January 31, 2008 at the Grace Village Retirement Community Chapel, Winona Lake, Ind. Entombment will take place at Royal Oak Memorial Gardens in Englewood, Ohio. 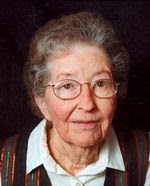 Mrs. Polman, 85, of 188 Grace Village Drive, Winona Lake, Ind., died on Sunday, January 27, 2008 at 10:40 p.m. at Kosciusko Community Hospital.